Olympic Rings and Other Things: Director Aaron Sorkin Deals Audiences A Club Flush With Olympic-Tethered Film "Molly's Game"
Director Aaron Sorkin Deals Audiences A Club Flush With Olympic-Tethered Film "Molly's Game"
While exiting the theatre after "Molly's Game" -- a new Olympic-tethered film penned by director/screenwriter Aaron Sorkin -- I wished for better recall of a Winston Churchill quote used toward the film's end in scenes on the slopes of a 2002 winter Games qualifying event. Or was is, "Success is not final, failure is not fatal: it is the courage to continue that counts" or similar? The perseverance quotation, spoken by Jessica Chastain -- in the film's title role portraying Salt Lake Olympic hopeful Molly Bloom moments after a dramatic, career-ending crash on a Deer Valley ski course -- are just a few of the many apt cultural and literary references served in this delightful drama that delivers as much excitement, speed and anticipated jolts as the toughest moguls line. Key to skiing success, as stated by Bloom's father Larry (Kevin Costner) in opening scenes: "Check your line." There are a number of fine lines and risks that could have taken Sorkin's storytelling out of bounds, but each time this viewer thought the story was gonna veer off course, it came right back to center for a flawless run. 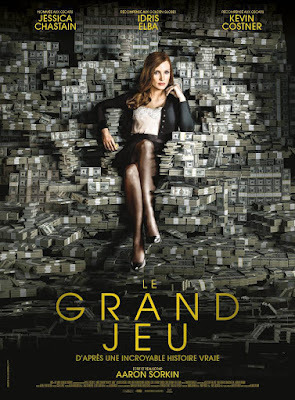 And though in trailers the "Molly's Game" marketers do not mention the title character's five-ringed aspirations, from the opening shot Olympian-level successes are at the core of Sorkin's writing and in Bloom's autobiography on which the film is based. Perhaps underscoring the marketing team's obliviousness (or disdain?) for Bloom's Olympic dreams, not one publicity photo for "Molly's Game" pertains to the ski incident. As with Sorkin's other outstanding projects like "Newroom" or "Malice" and "The Social Network" or "Moneyball," this film provides a fun and challenging game to determine the smartest person in the room because everyone's brilliant and one-up-man- (and woman-) ship through intelligence is celebrated. Not surprising, Molly Bloom often may be the smartest on screen, holding her own with tycoons of business, technology, Hollywood and other fields. Her Achilles' heels eventually show up, starting with the unfortunate twist of fate that left her unconscious and bloodied on a Utah ski slope. 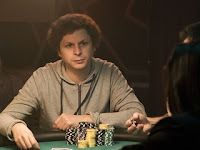 After the ski accident and during a soul-searching break to regroup and consider law school aspirations, Bloom stumbled into a secret world of high-stakes poker. 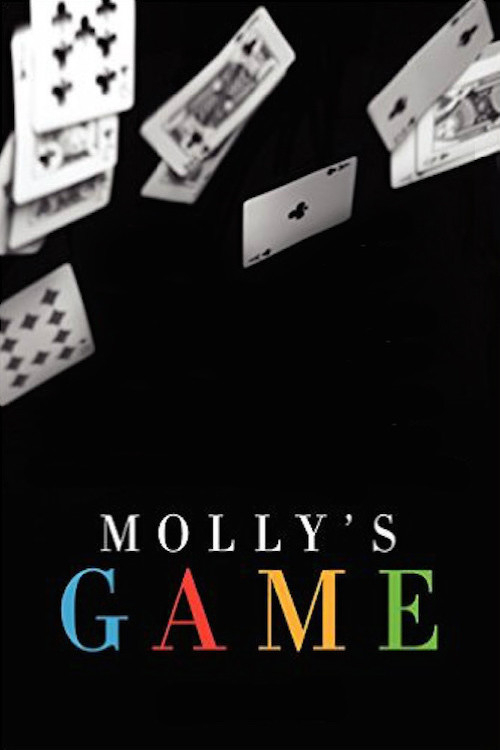 While her brother Jeremy Bloom became a two-time Olympic skier later drafted by the NFL, Molly channeled her superior intellect and business acumen into what became "the most exclusive high-stakes underground poker game in the world" (the partial title of her book). 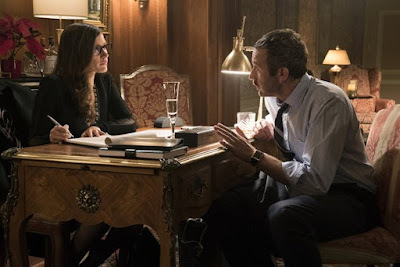 Through flashbacks during interactions with her New York attorney, who is crafted with originality by Sorkin and superior acting chops delivered by Idris Elba, Bloom takes her lawyer and viewers through the often glamorous though treacherous world of high stakes gaming. 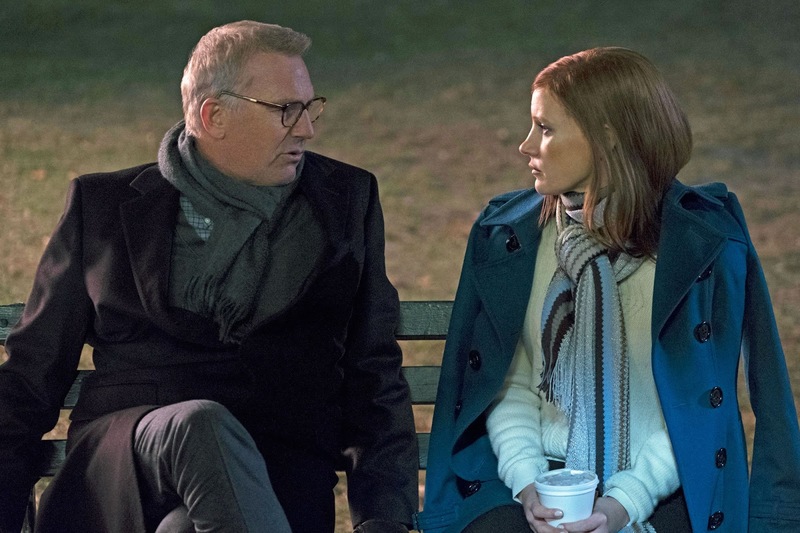 Sorkin expertly delves into the lingo, the statistics, the excitement, the losses and intrigue as though tying in the best of "The Cooler" and "Let It Ride" or any other poker-faced film. Sidebar: I kept looking for Ricky Jay to make a cameo or show up as a consultant as many scenes evoked his work in "House of Games" and "Deceptive Practice." I liked how Sorkin wove in Olympic-level near-misses also tied to the Berlin 1936 Games, describing how baseball legend Jackie Robinson's older brother Mack set a world record in the 200m athletics competition only to later become a janitor (he came in second to Jessie Owens by less than four-tenths of a second). Also enjoyed several cameos that brought together favorites from previous award-winning films. Graham Greene (previously with Costner in "Dances With Wolves") appears as a federal judge. Michael Cera finally appears against typecast as the darker "Player X" at the poker table. And Chris O'Dowd provides some comic relief as a drunk poker player turned unwitting Trojan horse in taking down the operation. 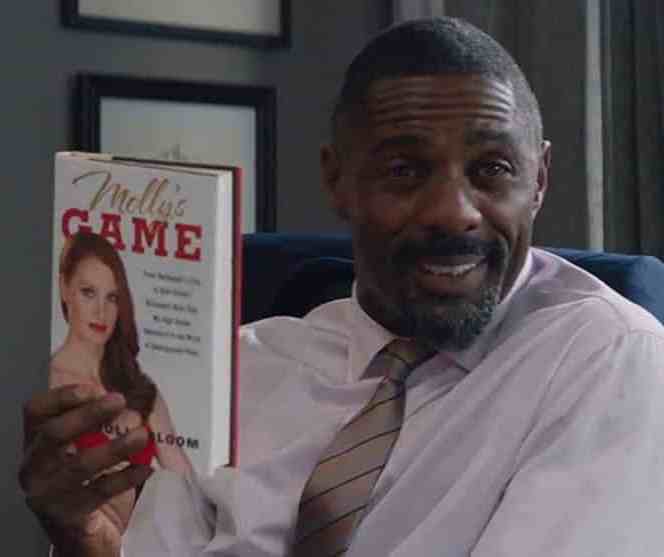 A nice surprise from "Molly's Game" is a look at the psychology of father:daughter dynamics. At the risk of divulging moderate spoilers, some of the best scenes involve Costner as the elder Bloom leveraging mental fitness in nudging his daughter to greatness. Later scenes introducing Elba as a star attorney involve his mentoring of a teenage daughter reading "The Crucible" assigned to her as literal "home" work out of the classroom. Some of these conversations are brilliant. One line for which to listen (more about iniquitous gambling): "You just don't want to break the law when you're breaking the law!" A friend who informed me of "Molly's Game" and its Olympic connections asked whether I plan now to read Bloom's book, which was new to me (somehow missed the publicity machine when it debuted and on the run to the film's release). Not sure the movie will inspire me to invest that time. But for those looking for great screenwriting, acting and poker-centric drama, "Molly's Game" is a winning bet. 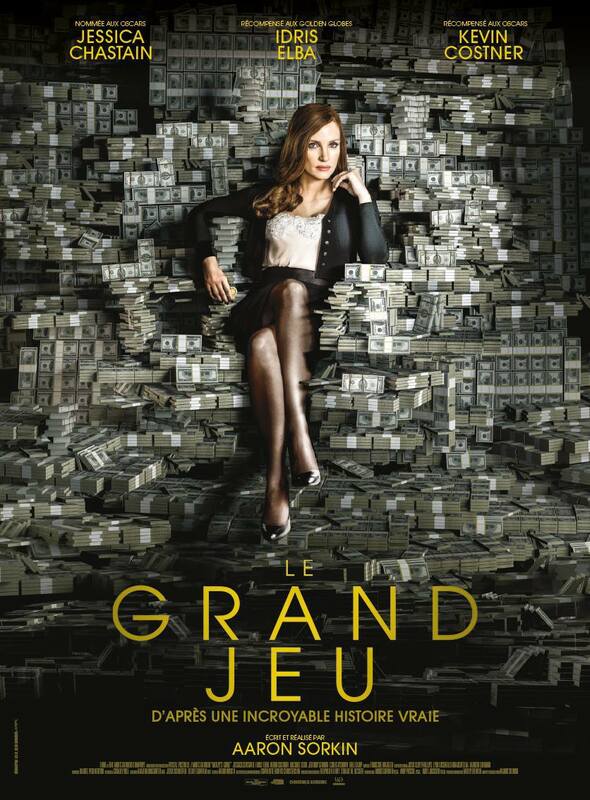 Photos via MollysGame.movie. Sorkin/Chastain photo by Chris Young of The Canadian Press.